Click picture for more details! Created for you by Minted global community of designers, our unique Save The Date designs are the perfect way to announce your wedding day. All Save The Dates are printed on luxe paper and are fully customizable. Don't have enough room on the front? Add a custom backer or interior to include even more photos and a more detailed message. Click picture for more details! Minted new Petite Save the Date Cards are a smart and chic way to save the date for your wedding. At 4.25" x 6", Petite Cards are a smaller version of our standard save the date cards. Each card is fully customizable and was created for you by Minted's global community of independent designers. Click picture for more details. Created for you by Minted global community of designers, our invitation designs will set the perfect tone for your wedding day. With unique designs printed on luxe paper, all wedding invitations are available with several matching accessories. Click picture for more details! 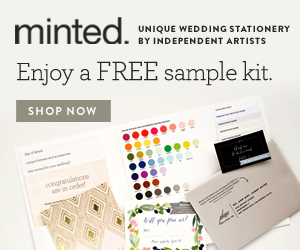 Put the finishing touch on your invitation with Minted wedding postage stamps. Our custom stamps are recognized by the U.S. Postal service and can be used for mail originating in the United States. Click picture for more details! Share the details of your wedding ceremony with a beautiful wedding program printed on luxe paper. All wedding programs can be customized to match any Minted invitation design and printed in the color of your choice. Click picture for details! Give guests a sneak peek of the meal to come with these unique menus. All menus can be customized to match a Minted invitation design and printed in the color of your choice. Click picture for details! Minted Thank You Cards are the perfect way to acknowledge guests who helped to make your event so special. The cards are designed to coordinate with our invitations or as a lovely separate piece. Here are some other blog posts you will love! Real Weddings - Summer Washington DC Wedding!